First potato plants peep through. Having been ridged up once, and due for their second, our Maris Peer second earlies are coming through and looking healthy. Today was the first day of our three-week cob build and workshop....keep watching for progress reports. The first day's team of cob builders having an introductory talk from Jo. 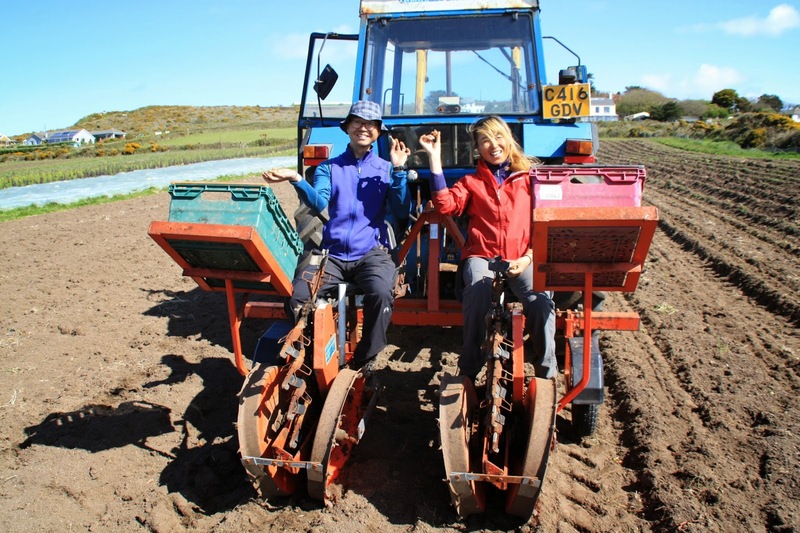 This morning we planted about 80% of this years onions, putting the sets of Sturon and Red Baron in by use of a modified plug-planter on the back of the tractor, with two volunteers feeding sets down a tube for four hours. 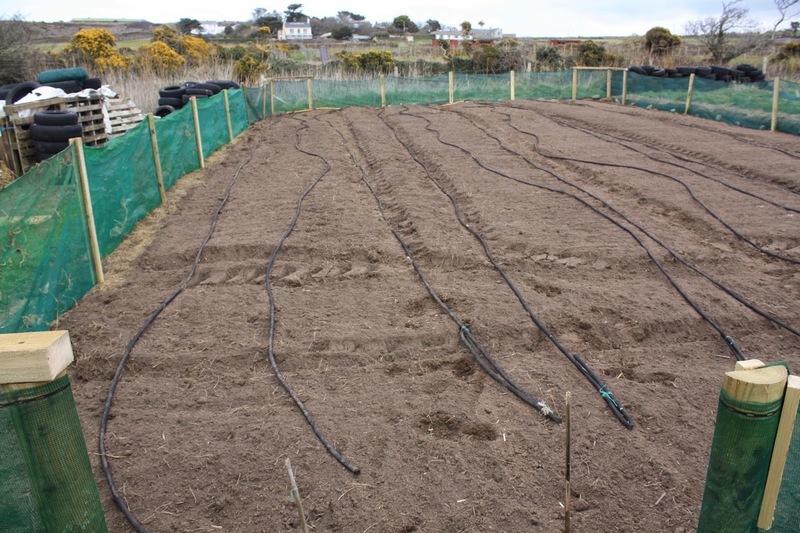 The remaining 20%, all of them red onions, will go in next week once we've prepared the next patch of ground (now that our cauliflowers and red cabbages are finished). Choi and Aggie on the planter. 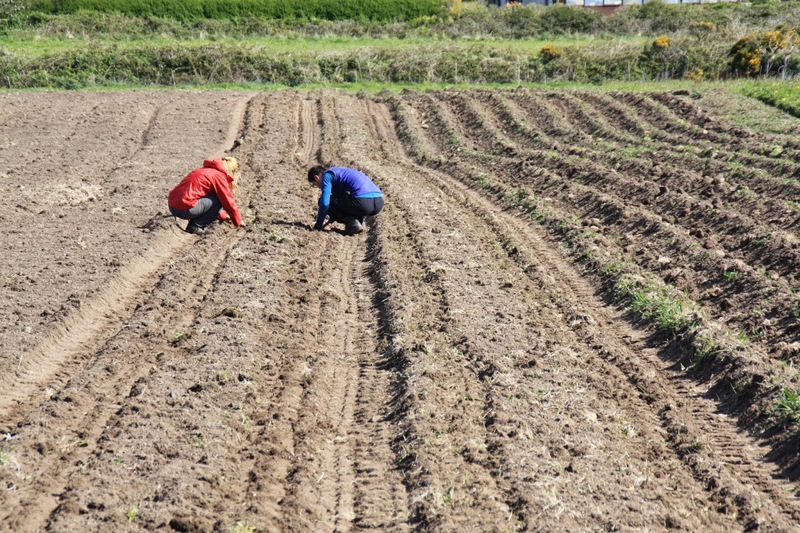 Choi and Aggie checking the onion lines for stragglers. Anne and Julien on the planter. 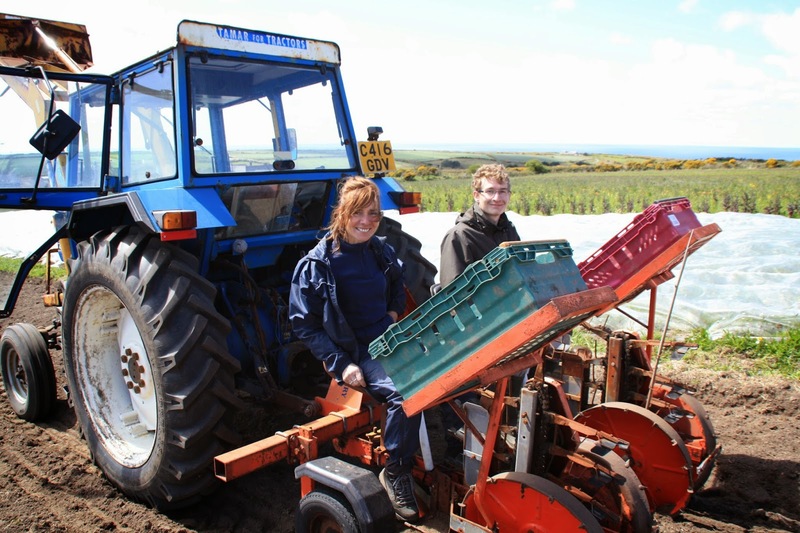 Last Monday and Tuesday (20th and 21st April) the farm played host to 21 students plus staff from Mounts Bay Academy in Penzance, as part of their activities week. Monday was an educational day with the theme "growing", and Tuesday was a volunteer session with the theme "changing an area/space". 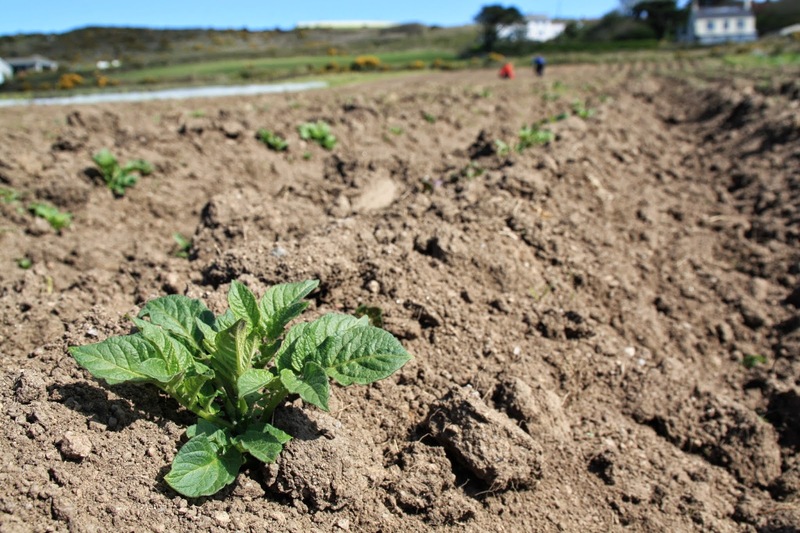 4) Seed-sowing exercise, sowing trays of plug-plants to use on the farm later this season (celery, cauliflower, cabbage, kale etc..). Lunch consisted of soup made from 14 different vegetables and herbs harvested from the farm, with a quiz to see how many they could identify - a commendable 11 out of 14! On Tuesday, the day's focus was the community woodland in our far field, during which the students transplanted almost 200 trees from our nursery into the woodland, protected them with stakes and guards; then checked all of the thousands of trees, guards and stakes in the woodland; and finally trampled the bracken and brambles that are encroaching into the top corner. 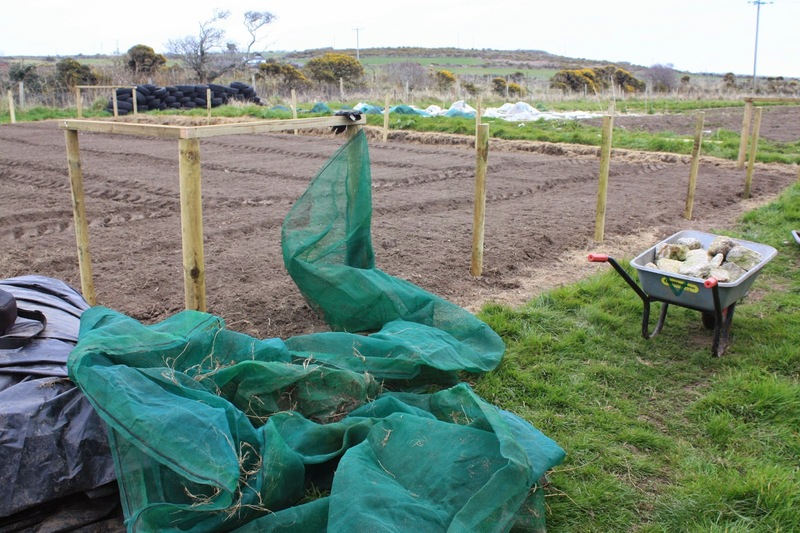 All this was finished by lunchtime, so the afternoon session was spent harvesting carrots in the market garden to allow the ground to be prepared for our next crop. 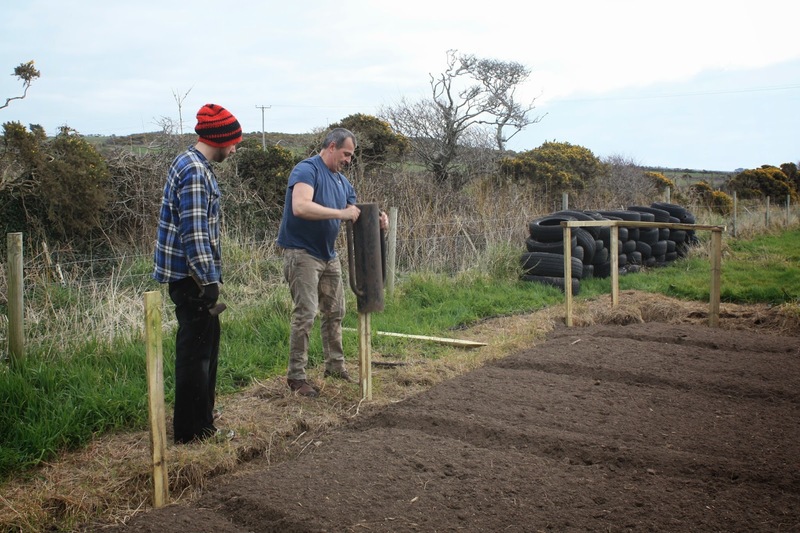 We'd like to thank the students for their good work and good behavior over the two days, the academy staff for choosing the community farm, and the team of farm volunteers who helped facilitate the programme. 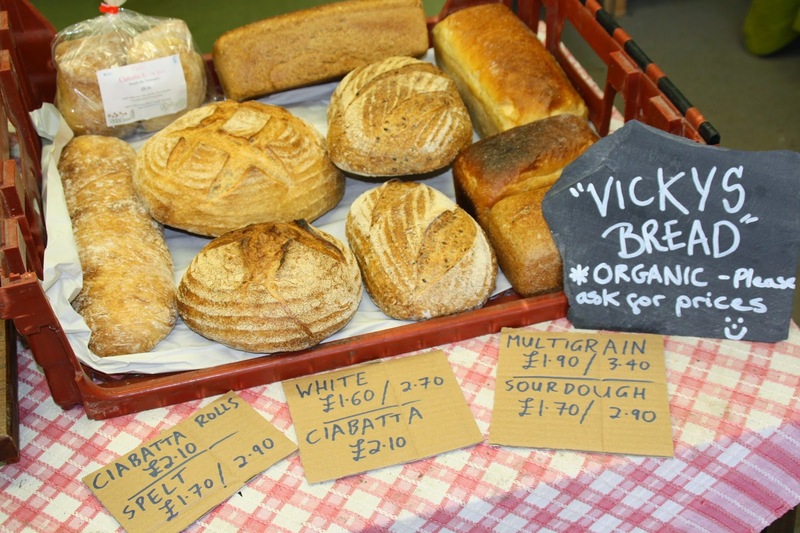 Vicky's bread is baked by hand in Helston - see their website for more details. 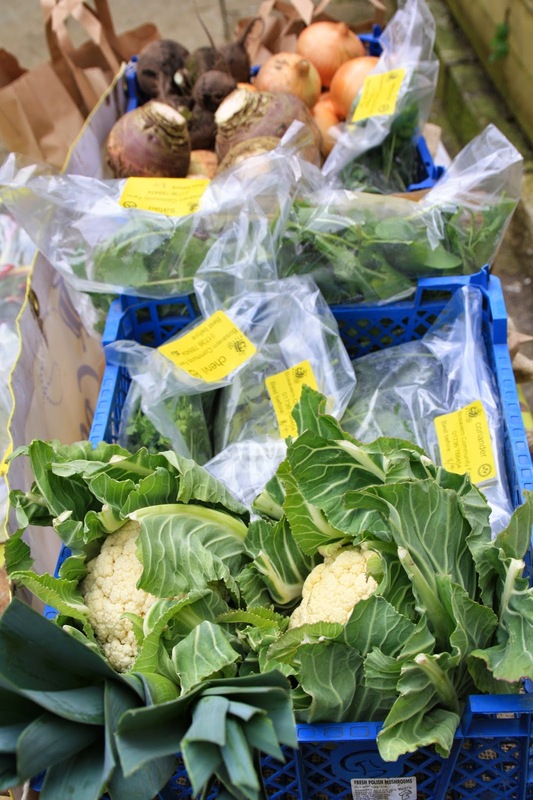 Thursday is a big harvesting day for us, as we begin to prepare the veg boxes and wholesale orders, before finishing them off on Friday mornings (we always try to pick everything as freshly as possible). 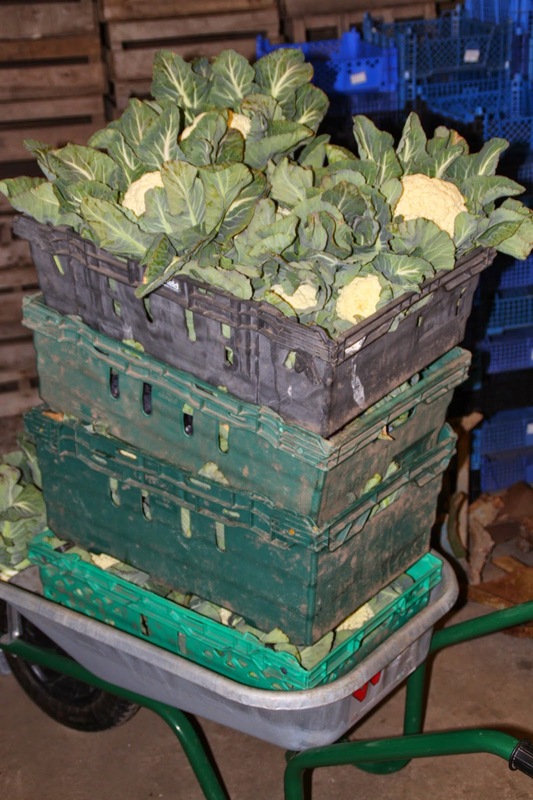 This week's leaning tower of cauliflowers. 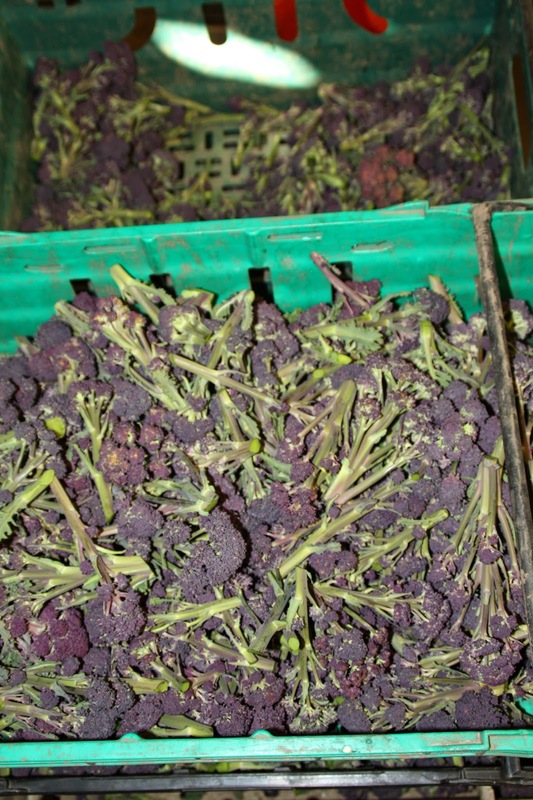 Part of this weeks 40kg of purple sprouting broccoli. 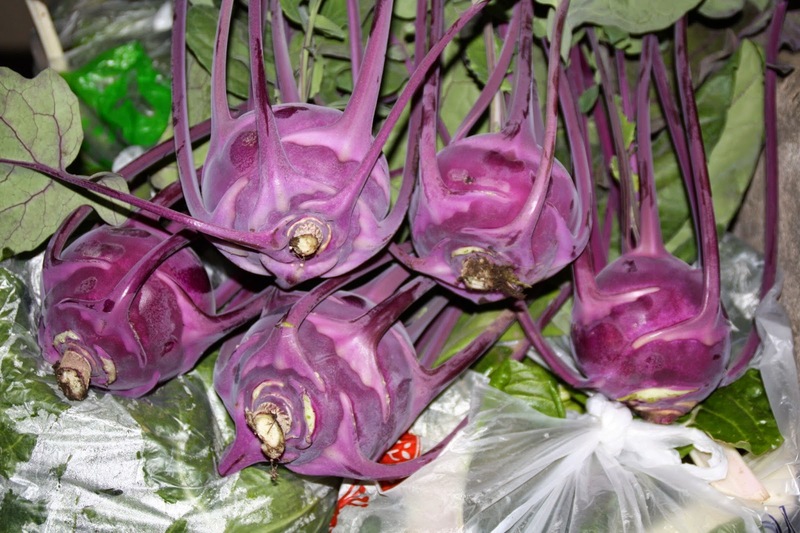 "Azur Star" kohl rabis raised in the polytunnels over winter. 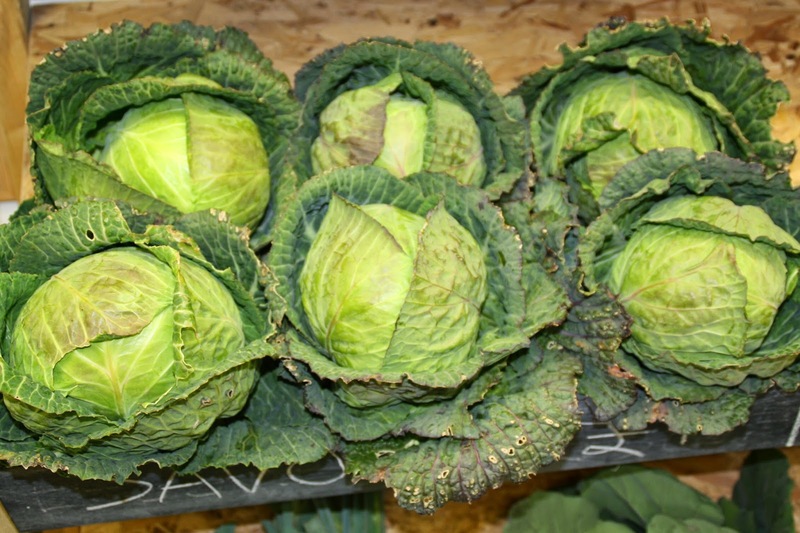 Tundra cabbages for sale in the farm shop. 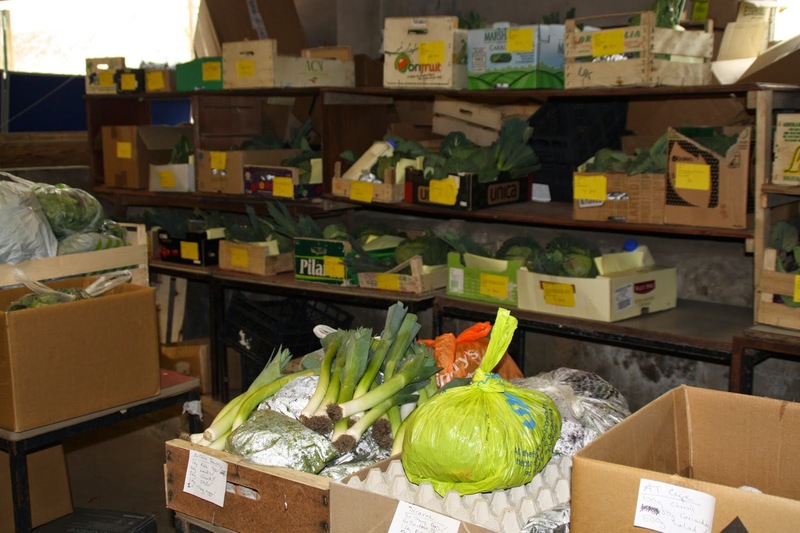 Veg boxes and wholesale orders almost ready to go on a Friday morning. 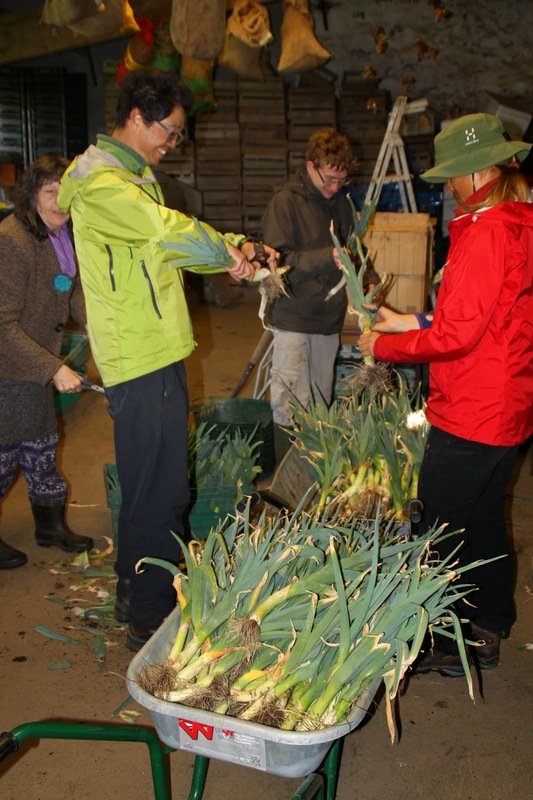 Dressing leeks in the packing shed. 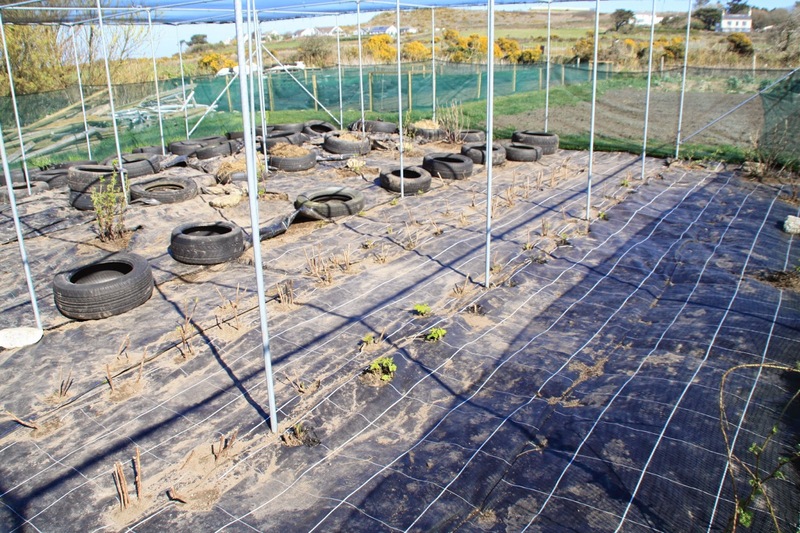 Thursday is also a volunteering session, so please come down to the farm between 10am and 3pm and help us harvest - see you there! 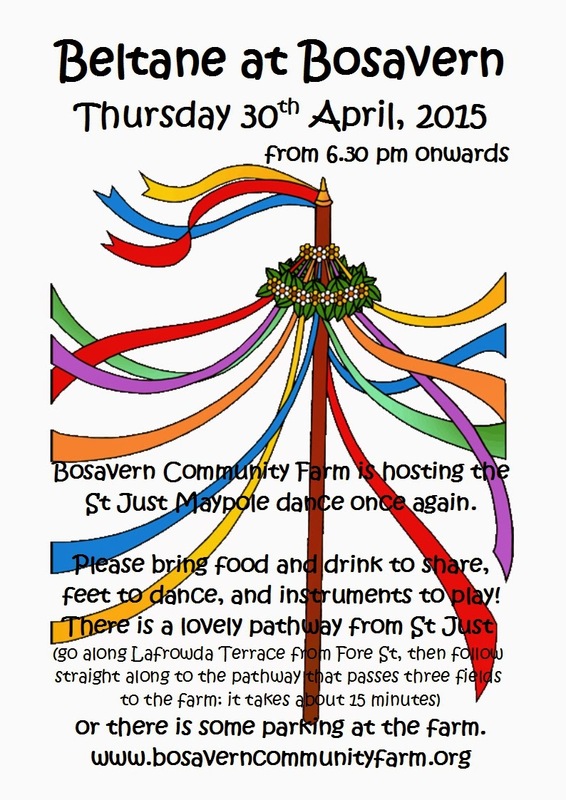 As in recent tradition, Bosavern Community Farm is delighted to be hosting this years maypole dance on Thursday 30th April from 6:30pm - this is open to all so please come along and welcome in the summer. 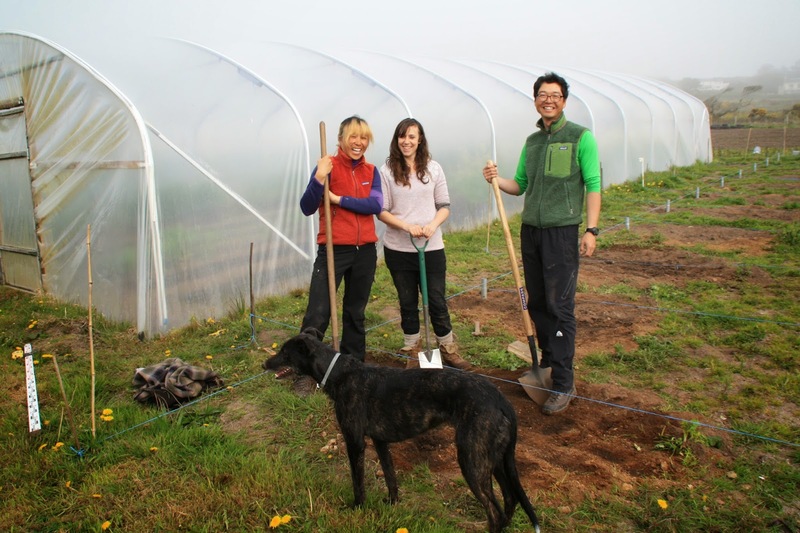 Many thanks to Cas, from Totnes, who left this afternoon after volunteering on the farm for ten days (see her in the polytunnel foundation photos posted previously). Have a safe journey and we hope to see you again some day soon. 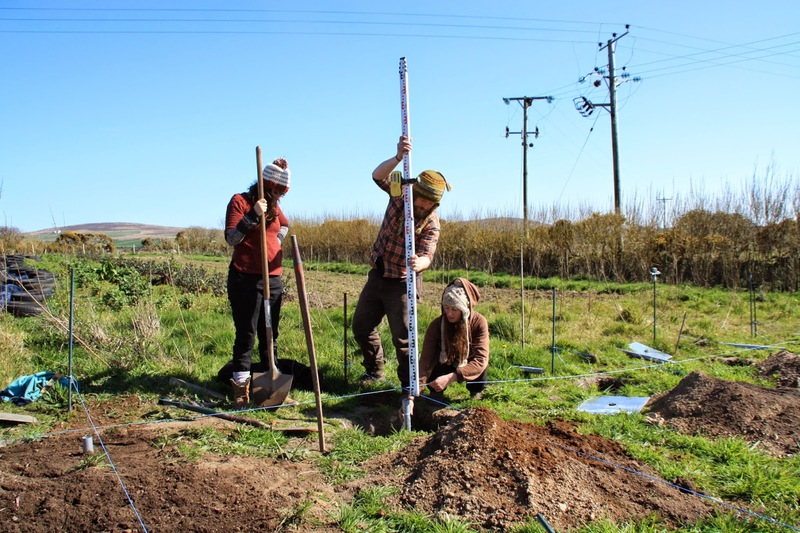 Installing the first 16 foundation poles last Tuesday, with Cas, Pete and Nikki. Finishing the final 6 today, with Aggie, Cas and Choi (and Tigerlily of course!). 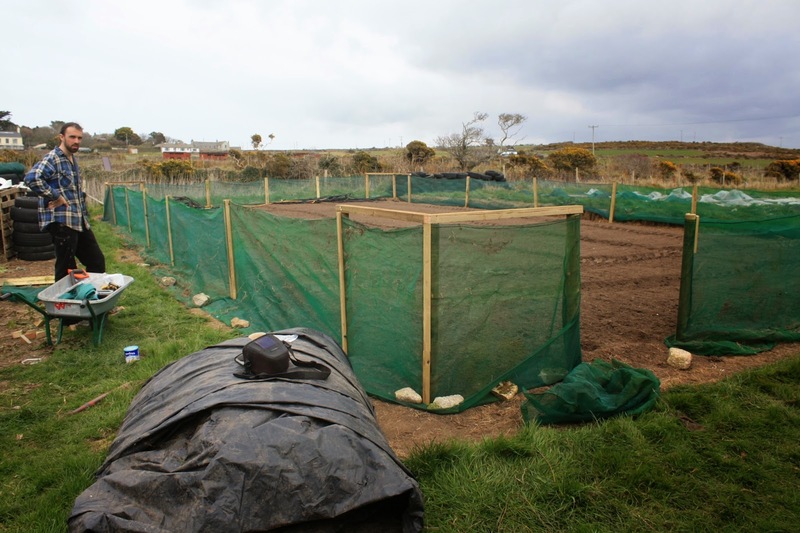 Over the past few weeks we have gradually dug over 60% of our new fruit cage, and transplanted our existing fruit bushes into it. 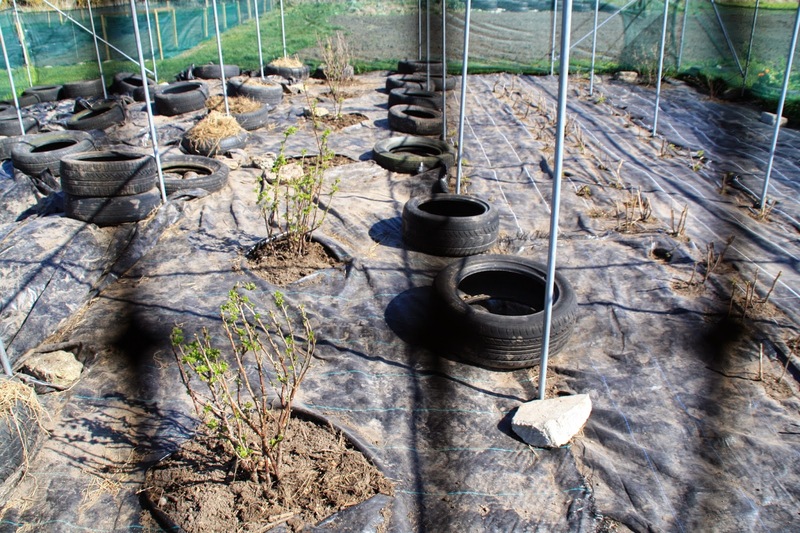 The fruit cage is now home to 6 blackcurrant bushes, one gooseberry bush, several clumps of tayberries, and about 50 autumn fruiting raspberry canes. With these we hope to be able to supply some fruit later this season. We plan to finish the other 40% of the cage early next year. 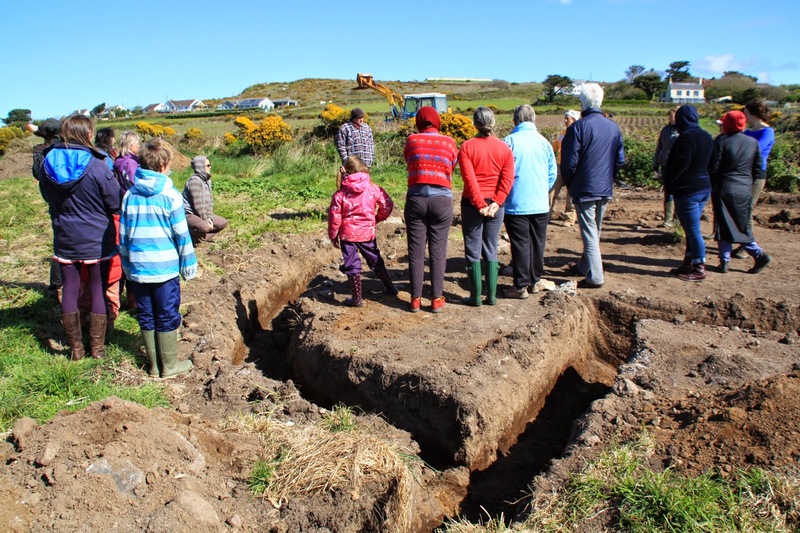 Many thanks to Nikki for leading this project, and to all our volunteers who helped with the digging and planting. 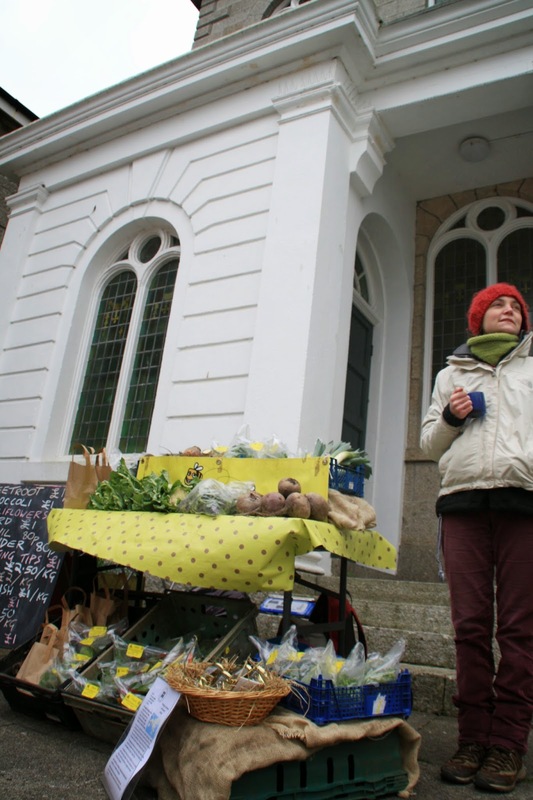 Yesterday, Saturday 4th April, saw the annual Green Fair held in the Methodist Church Hall on Chapel Street in Penzance, whilst the weekly Chapel Street Market took place on the forecourt. 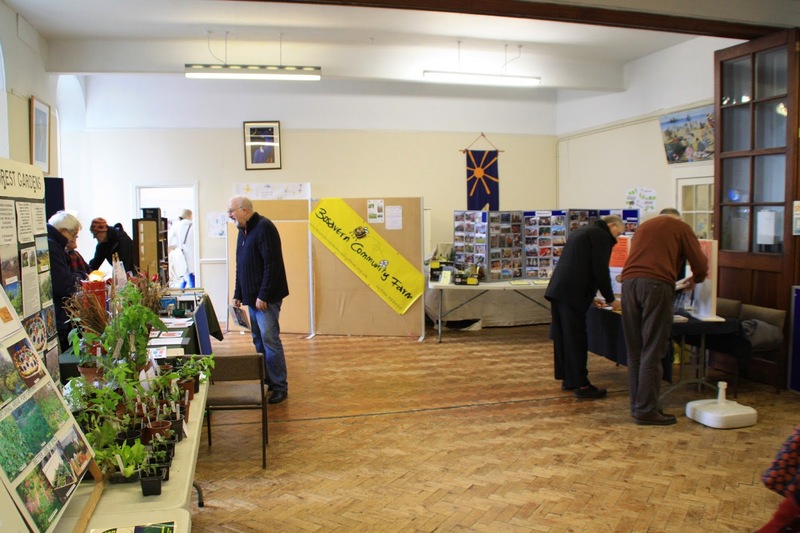 Bosavern Community Farm was represented at both events, with a produce stall outside and an information stall inside, both of which were well received and raised the project's profile with the local community. Alice with our stall at the producer's market (many thanks to Alice for volunteering to run our stall). 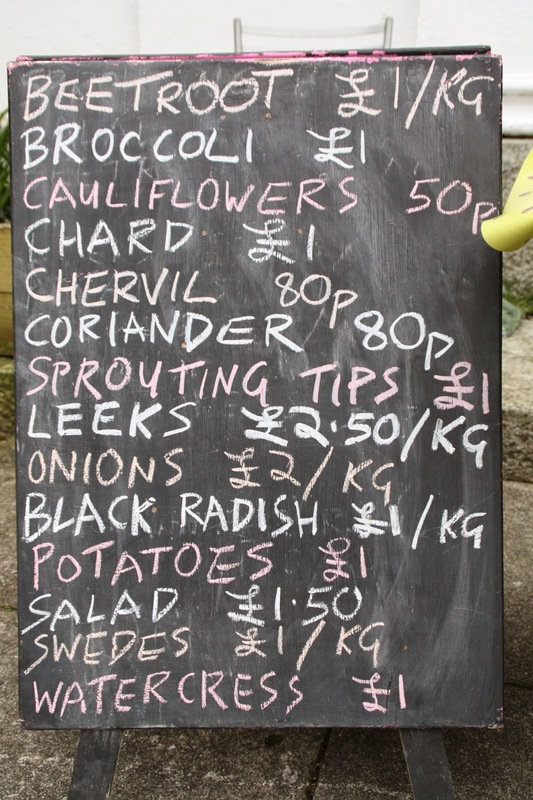 Some of our lovely produce for sale outside. The Green Fair getting set up at the start of the day. 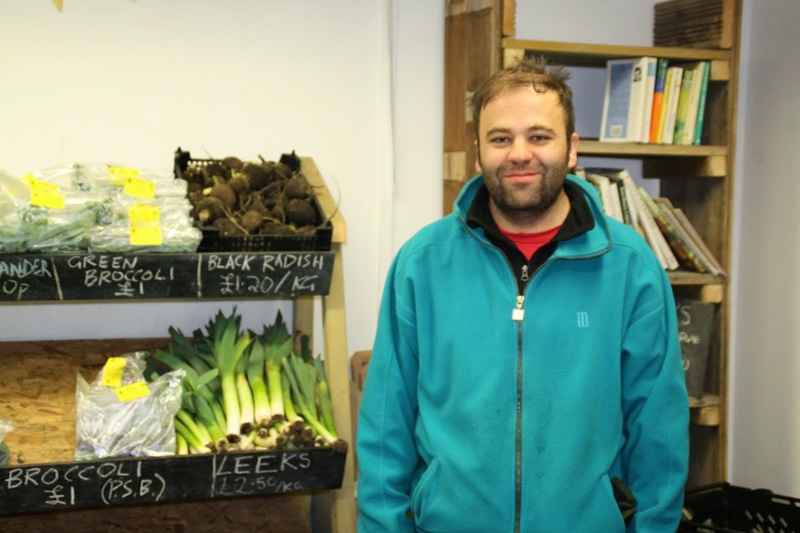 Yesterday afternoon, Alberto, from Toledo in Spain, left the farm after volunteering for a week (pictured above in the farm shop) - many thanks to Alberto for all his work. Finishing our outdoor sheltered bed. 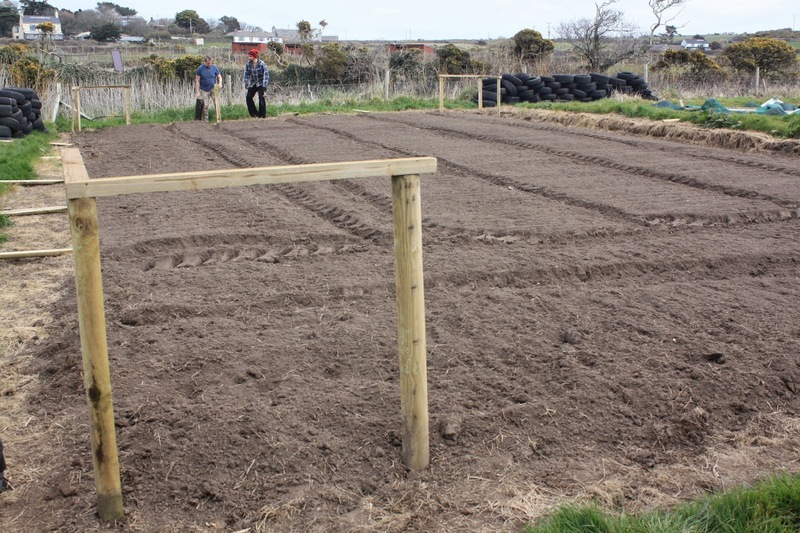 Last Monday and Tuesday we finished work on our outdoor sheltered bed, and sowed one third of it with an early salad crop. Building the corners of the bed. Felix and Pete knocking in half-round posts to hold the wind mesh. Starting to attach the wind mesh at the gateway, with a barrow of rocks to hold it down to the ground. Wind mesh attached and battened all the way round.